Our phones have evolved past a simple pocket computer. They have become more like Swiss Army Knives, opening up possibilities that were previously considered Sci-Fi material. Thanks to the recent push into augmented reality, a new world of tools is becoming available to mobile users. With Apple's ARKit and Google's ARCore, Android and iOS users alike can now enjoy augmented reality (AR), enhancing the real world around them with software. While this technology is still in its infancy, we are already seeing some practical applications. One such implementation is a surprisingly accurate tape measure. Currently, there are two software tools that Android and iOS developers can use to build AR apps. Apple's SDK is known as ARKit, while Google's version is called ARCore. Both rely on hardware and software to work properly, resulting in a limited number of supported devices. Note: The OnePlus 5T, Samsung Galaxy S9, and Galaxy S9+ don't currently support ARCore, but will in an upcoming release. 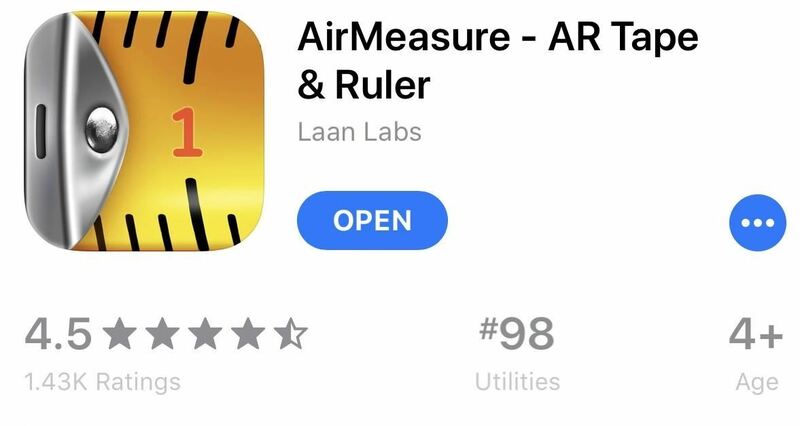 Head over to either the App Store (iOS) or the Play Store (Android) and download the app Air Measure. You will not see the app if you are currently on an unsupported device. Next, open the app and it will ask for access to your camera. Grant this permission, then point the camera at the floor to let the app get its bearings. It's important to hold your phone steady for this part. After a brief time initializing, the iOS AirMeasure app will provide you a tutorial on how to use it. The Android version will jump right into things. When you're using this app in the future, you may need to calibrate it again. If the circle in the middle of the screen is red, move your phone around slowly so that it can scan the environment. Once it's calibrated again, the circle will turn green, indicating you're ready to measure. (1) Calibrating the app. (2) Green circle indicating that the app is ready to measure. Measuring is accomplished by aiming the circle at the edge you wish to start the measurement from, then selecting the white arrow in the blue background below it. This will bring out the tape measure (iOS) or a blue-green line (Android), which you can control by moving your phone. Once you reach the ending edge, select the white arrow again to measure the distance between the two points. Once you've added your first line segment, you can measure another by repeating the same process. You can also delete measured line segments by tapping the trash can icon towards the bottom-right corner of the screen. The iOS version of this app is a bit more full-featured than its Android counterpart, so there are a few other settings you can play around with like a measurement history and a "Tools" button that includes features like surface measuring and a virtual picture-hanging tool. (1) Deleting a measurement. (2) The "Tools" menu on iOS. It seems our phones will never stop evolving. As hardware continues to improve, developers will continue to create new apps that replace the tools we always knew. Eventually, we will need nothing more than our smartphone for most of life's needs. What do you think of the AR measuring tape? Do you find it more helpful than the actual tool? Let us know in the comments below.